The weather forecasting and been solid all week up till Friday afternoon, it was going to be SE breeze on Saturday. We spent a nice night in Issy Bay, though there was a little noise, and on Saturday morning there were 9 yachts ready to start on their individual start times, as this was a “Mark Foy” start race. First away was Ocean Rhythm at 10:45 followed soon after by “Sneaker”, a Chris White 26 sailed by Sarah Dance, her man Robb, and friends Nick and Kim. Sadly there was hardly any wind, and it was coming from the South. These 2 boats tacked backwards and forwards trying to escape the outgoing tide and they really had little luck. Alberta Rose had been fishing, and they motored down towards the start line, but never seriously started the race. Next to start was Tomodachi at 11:02, and the wind was still very light and from the South. The big yacht did make some progress, doing well to engineer an escape from the apparently flat calm area around the start line. By now, Ocean Rhythm had also worked away from the line a little way. Next start time was 11:12 for Incentive, but they had misjudged the time it took to get to the start line, and they switched off their engine at 11:08 like the good, honest citizens they are, and found themselves with a long beat and no wind just to try and reach the line. The result of this was that Incentive probably only crossed the start line at around 11:20 or maybe even later. Romany started next at 11:14, and found better luck down the Eastern end of the line, and was soon flying along at 1.8 knots boat-speed. This was all very well, but there were a lot of outrigger canoes racing past, and these caused everyone to have to take avoiding action – not easy to keep clear at such low speeds, and some yachts had to sail sideways a bit just to stay clear. Nonetheless, by this time, Ocean Rhythm was sailing well, albeit very slowly, towards Navy Buoy, as was Tomodachi. A little while after this, the folks on “Sneaker” decided that this day was too good to spend sitting still near Issy Bay, so they set off towards Oneroa for a swim. Next start was Outlaw at 11:22, and by now the wind was setting in slightly to be fairly steadily SE at about 3-5 knots, so Outlaw was soon able to escape the really light-wind zone. Mr Roosevelt should have started at 11:24, but for some unaccountable reason was about 8 minutes late over the line. Last away was Starlight Express at 11:35 – they made a good start down the Eastern end of the line, and were quickly on their way in reasonable breeze, as the SE had filled in by now, and Starlight was heeling to the breeze as she sailed towards Navy Buoy. The leg to Navy Buoy ended up being a simple tight reach by the time the SE had filled in properly, and first around was Romany, then a small gap to Outlaw, Tomodachi, and Ocean Rhythm who rounded as the wind began to clock left towards the East. After these came Mr Roosevelt, Starlight Express and Incentive, but Starlight was already showing her extra pace, and had probably caught up to those boats by Navy Buoy. After rounding Navy Buoy, the wind just kept on swinging left, toward E, then NE. Romany being in the lead at the buoy was on the outside of this persistent shift, and Outlaw and the other yachts were able to catch up a fair bit here, and Outlaw passed ahead of Romany when Romany tacked across towards Motuihe. Starlight was next, going very well, then came Tomodachi, sailing nicely in the light breeze, not far ahead of Ocean Rhythm, Mr Roosevelt, and Incentive. Both Tomodachi and Ocean Rhythm prefer a decent wind to deliver their best performance, but on this day, the crews were doing a fantastic job of keeping these boats moving well in what was really quite light breeze. Outlaw was showing excellent speed, and Romany was also very comfortable in the light with her relatively tall rig. Mr Roosevelt was sailing sensibly after their late start, and were making good course choices, despite the fact that Matt Woodley had only flown into Auckland at 5:30 am. It was an excellent effort on his part to be out there jet-lagged after such a trip. Starlight Express was simply going much faster than everyone else, the tall golden sails gleaming in the beautiful sunny, conditions. Not long after passing South of Motuihe, Starlight Express was in the lead and trying to find a way through the massive wind-shadow that was standing like a fortified wall blocking progress through the Sergeant Channel. At this stage, it was only about 12:30, and Starlight was already in front, Romany by now was back in second place again, as Outlaw now found themselves sailing the outside curve of the persistent left-hand shift, and after Outlaw, Mr Roosevelt was doing well taking a line towards Motuihe shoreline. Tomodachi, Incentive and Ocean Rhythm were all relatively close together, and sailing OK in the now very light breeze. Starlight worked their way in towards the northern beach of Calypso bay, but there really was hardly any wind in this area by now, and the tide was holding the yachts out. There was some talk of possibly abandoning the race, and as it was now around 1:15, Starlight retired and headed off towards Onetangi. Mike and Cassie had a lot of young people on their boat, as they had picked up a couple of Jonathan Ash’s friends, and they wanted to get to a beach if possible. Eventually the race was not abandoned, but shortened at about 1:35pm to finish at the Easterly cardinal mark just north of Calypso Bay. The shortened course was a good decision at the time – it was getting late and we all wanted to be in Onetangi. Starlight had almost been at this new shortened course finish point when they retired, so it is a pity that they did not finish, as they would have won this race easily – they were so far ahead of the rest. When the race was shortened, we could all see the wind to the North of the Motuihe, but the wind shadow effect of Waiheke still maintained a solid barrier of no wind near the entrance to the Sergeant Channel. At this time, Outlaw was probably closest to the finish, being just ahead and to windward of Mr Roosevelt, who in turn was just ahead and to windward of Romany. The other yachts, Tomodachi, Incentive and Ocean Rhythm were slightly further South, but slowly working their way up NW towards the Motuihe shore where the wind seemed to be better than it was further to the East. It was tough sailing in the Sergeant Channel. A number of times we had zero boat-speed, but sometimes enough breeze filtered through to allow us to respond, and at one time the 3 lead yachts all tacked towards the East. When Mr R and Romany tacked back to the NW, Outlaw kept going, and seemed to sail away from the finish as the tide took her away to the SE. In the end, there was a little sliver of breeze further in towards Motuihe beach, furthest away from the lee of Waiheke, and Romany was able to short-tack up along the line of reefs in this little feather of wind, and ended up taking the gun at around 14:26. I mention the time, because that gives some idea of how slow the progress was to the finish from when the race was shortened. As can be seen, it took approximately 50 minutes for the fastest finisher to sail about 900m across the ground from when the race was shortened. Mr Roosevelt crossed second, then came Outlaw. The other yachts had made a good approach coming in from the West along the Motuihe Shore, and Tomodachi, Incentive and Ocean Rhythm were all able to finish as the wind managed to push through the furthest edge of wind-shadow zone. On a personal note, special thanks from us to Karen from Tomodachi, who delivered a wine-stopper to Romany after the finish. She had been horrified to see me nibbling at a champagne cork so that I could re-stop a bottle at the previous week’s BBQ, and had promised to find us a proper stopper. Karen, you are a scholar and a gentlewoman, thank you. When the results were done, Romany had made the double taking Gun and handicap, with Mr Roosevelt second, and Ocean Rhythm a very well-deserved third. Mac Nell did a very good job in this race, sailing Ocean Rhythm in very light air, not her best conditions, and having the worst of the wind at the start. Tomodachi was fourth, having also sailed very well in those light airs. Then came Outlaw, who showed really excellent speed throughout the race, but took an unfortunate tack close to finish time. Incentive was sixth on corrected time after their late start. It was good to see Wendy and Fred were able to make to this race, as Wendy had given her leg a good crack slipping on some steps, and the injury was reasonably serious, so we were unsure if they would come out for this one. We on Romany were happy with our race, the light conditions suit our yacht well, and Lindsay did a lovely job of helming the boat, tacking smoothly and efficiently in the light breeze to enable us to work through the narrow waters close to the reefs near the finish. We were very pleased to cross first, as Mr Roosevelt was right there. Matt and Cath were a bit unlucky, as being to windward was for once no help here, and they were just not far enough West to feel the feather of breeze that we found to leeward in those flukey conditions. Once the yachts had cleared the finish area and motored a bit further North, we were clear of the worst of the wind-shadow, and most boats sailed from about Owhanake to the Eastern side of Onetangi in what was a brisk NNE breeze of around 12-15 knots. The BBQ was held on the stony beach at Woodside bay in Onetangi – the NNE breeze was setting up quite choppy conditions in the bay but it was forecast to go SE later. Sausages had been brought by James, and they were very nicely cooked by chef Mike Wilson. We drank the rum bottle for Gun position on the beach, and chatted to all the folks there. It was nice to meet the people from “Sneaker”, and we were also joined by Mike and Eileen Smith who had come round in their launch to join us at the beach. The wind did tend SE during the night, so the bay was fairly calm while we slept. Sunday was another lovely, sunny day, and the Onetangi Horse Races were held on the beach – some of the yachts went over there to watch the proceedings, while others stayed in the bay for a leisurely coffee and a chat. Wind was nice, and allowed a pleasant sail home at the end of the day. Apart from the light winds experienced in the race, mainly courtesy of the wind-shadow from Waiheke being in the way of the NE breeze, Summer Cruising does not get much better than this. 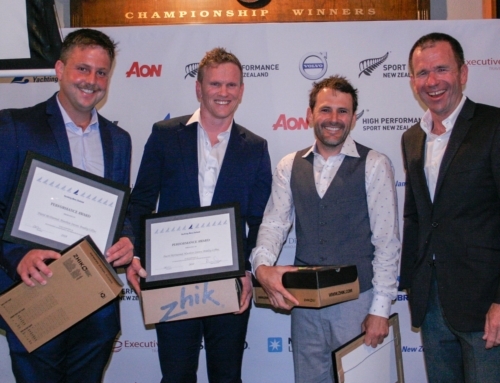 As always, thanks to our generous sponsors, Orakei Yacht Sales and Columbus coffee – we all enjoy the racing and our prizes. Results are attached, please check that your times and series positions look right. Let me know if you see any errors or if you think your handicap is not right. 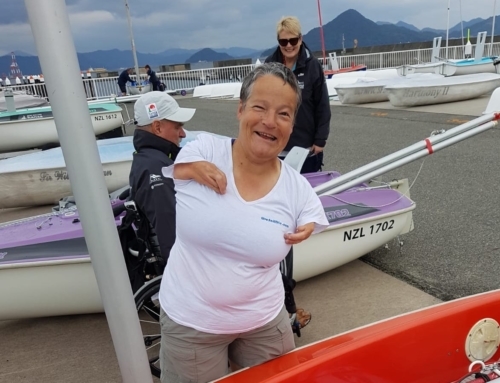 Note that I have altered Sneaker’s handicap to something more appropriate for the yacht after our first view of her sailing – we will see how they go after a few more races.